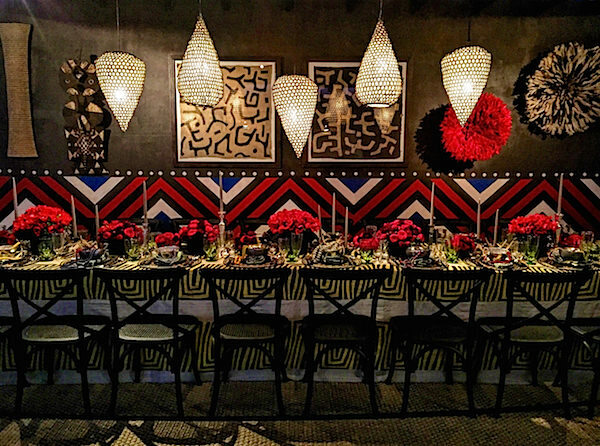 In several weeks of busy events, the DIFFA Dining by Design 2016 gala last night was a highlight. 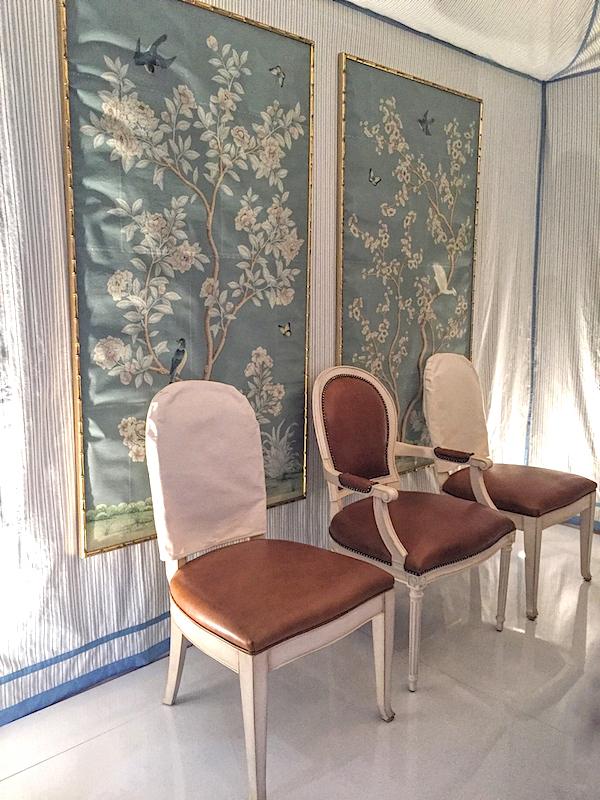 The annual tabletop fundraiser for this worthy cause featured 50 vignettes showcasing the talents of designers in collaboration with brands, publications and manufacturers. We’ll take a look at more of these creative dining environs, but first a quick peek at a few favorites. I was delighted to be sitting at the Henredon table designed by Mark Sikes. Celebrating his upcoming collection for Henredon, Mark designed a freestanding dining pavilion tented in his signature blue and white stripes, accented with Samuel and Sons trim. Inside, a timeless mix was created with framed Gracie panels surrounding a new burled Parsons dining table and armchairs from the collection. 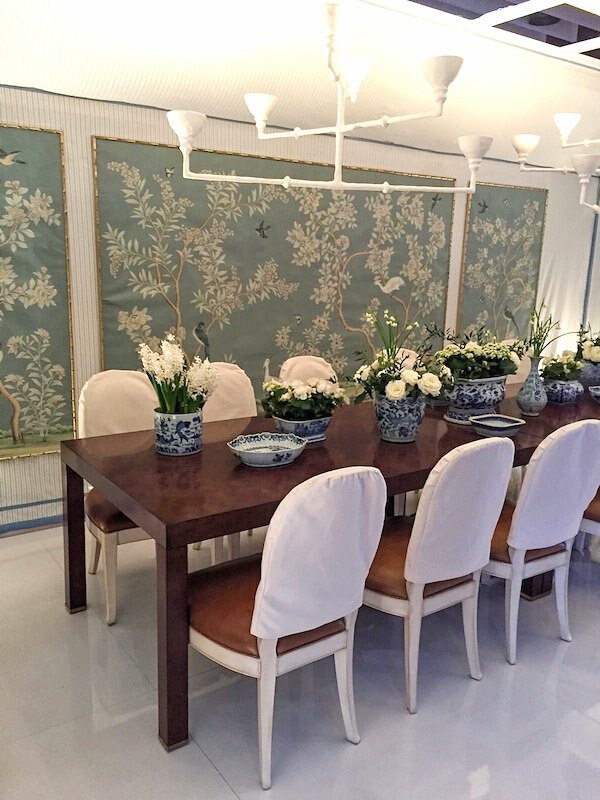 Plaster chandeliers, custom hand made by Stephen Antonson specifically for the space and blue and white porcelain from John Rosselli completed the pretty picture. Ralph Lauren Home showcased their new Black Palms collection, capturing the serene spirit of a restful resort. Natural materials in warm tones and soft ambient lanterns and hurricanes set the stage for sophisticated dining in natural surrounds. Basket-woven and braided water hyacinth chairs at a modern teak table set with geometric patterned accessories and hand-painted Kendall porcelain evoked handcrafted understated elegance. 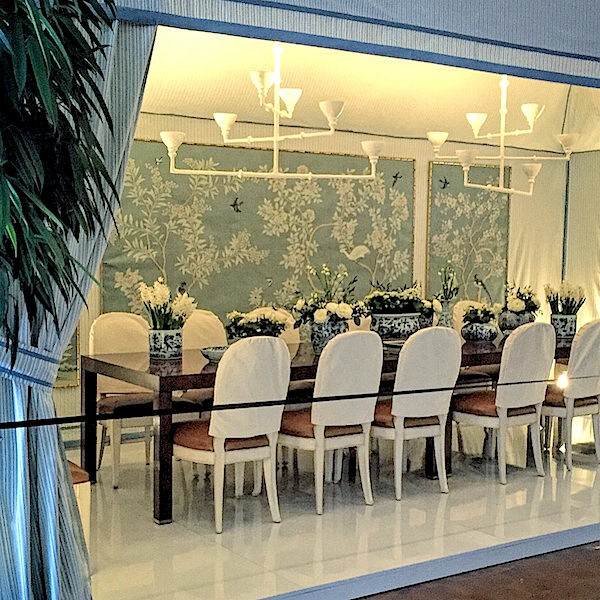 Bronson Van Wyck created another winning table this year for Architectural Digest. 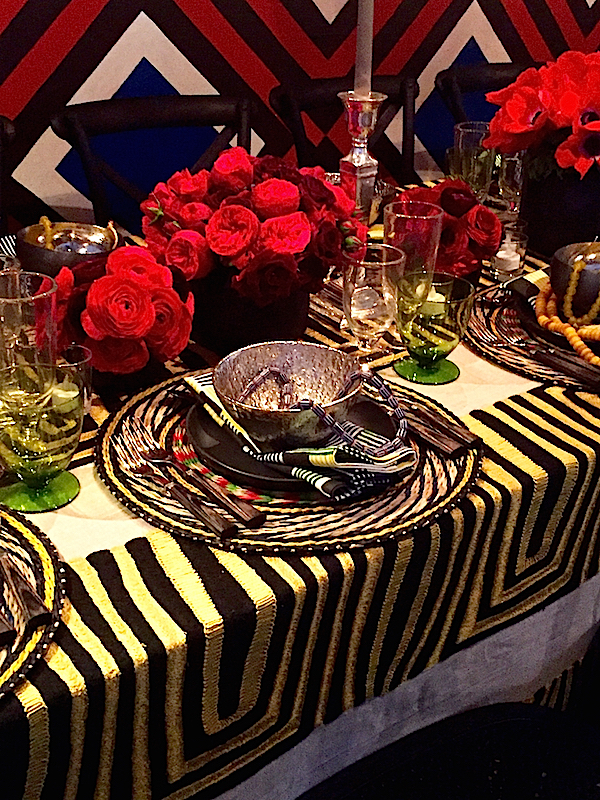 The African inspired scene featured a brilliant and artful mix of color and pattern. 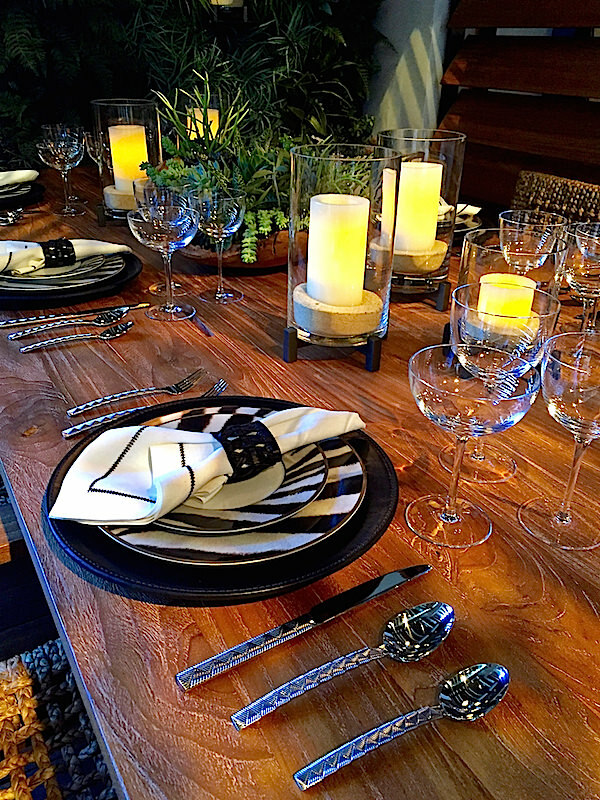 A bold striped tablecloth of Selby linen by Larsen sat under Fierro bamboo place mats with illusion Wave napkins by Dransfield & Ross, accompanied by handsome Ralph Lauren Home Zen flatware. 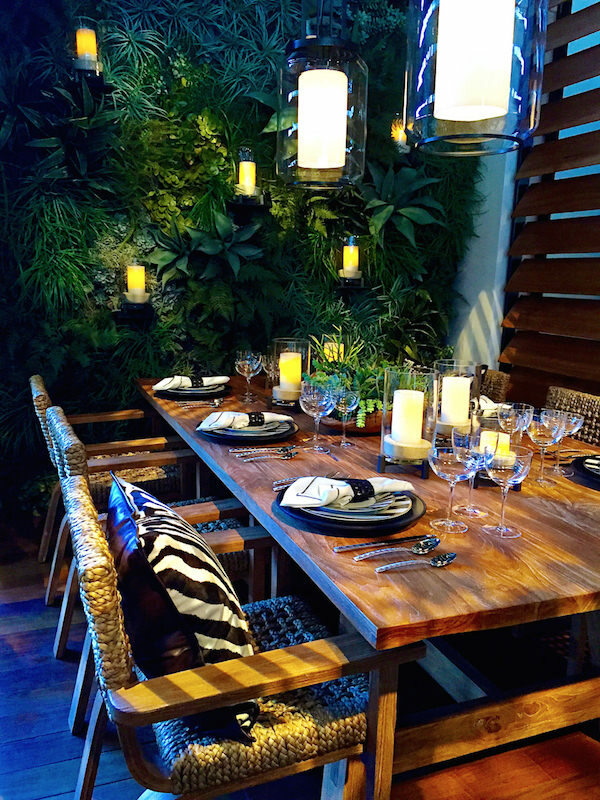 Distinctive Pod light fixtures from Tucker Robbins illuminated tableware from Michael Aram and Blue Pheasant as well as green glass goblets from Canvas Home. Varden often features large central artwork, in this case, Claire Sherman‘s Diagonal Tree, which, for the designer, paralleled DIFFA’s mission. “I saw these gorgeous, broken, fallen trees, once so strong, ravaged yet still beautiful, still imposing in their beauty, paralleling the destruction of AIDS on the landscape of humanity. The beauty of the memory of those we lost is juxtaposed against trees that are still standing, those for whom HIV is no longer a death sentence.” The striated lines of Stark‘s new stone-like Paria Canyon wallpaper grace both walls and floor, lending the room an organic and dynamic feel, echoed subtlely by the elegant ebonized strié finish on the Artistic Frame chairs. 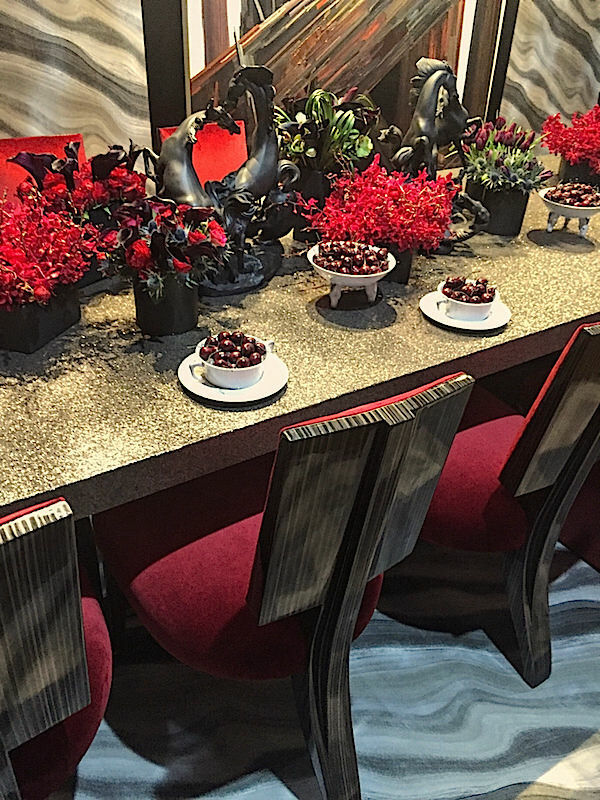 Stop back soon for more from DIFFA’s Dining by Design 2016. This entry posted in furniture, interior design. 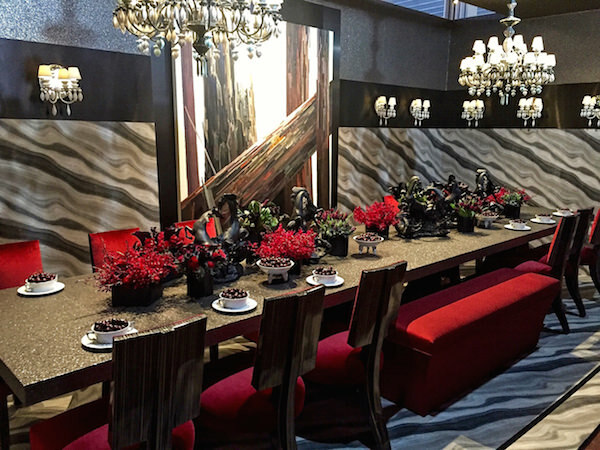 Entry Tags: DIFFA Dining by Design, interior design, Tabletop, tabletop gala Bookmark the permalink. Stacey, These photos and vignettes are incredible! My favorite is by Darrin Vardin, everything in this space speaks to me the horse sculptures the chairs the red.. love it all! 80 queries in 0.696 seconds.